After spending some time with Sebastien in Paris I took the TGV to Nimes and met my oldest and dearest friend Karina. We stayed at a Kryiad hotel which was close to the train station and arena. We spent a lovely time eating and catching up that evening. The following day we walked around the historical Roman arena. They still hold bull fights in the arena today. There is also an audio guided tour that you can do. It was interesting and gave you the feel of what it was like back in the day. There had been a bull fight there the previous day and there was still blood in the sand from the fight. Sad. For the next few days I am going to blindly choose random pictures from our travels and explain a little about them. Today I selected from my Vang Vieng files. Enjoy. Quality of this pictures is not good but the memories are. Here we have Sebastien and I with our Canadian twins Scott and Chantal. I am sure a Friends episode was playing in the background. This is a pictures from a village we walked through during our kayaking trip. 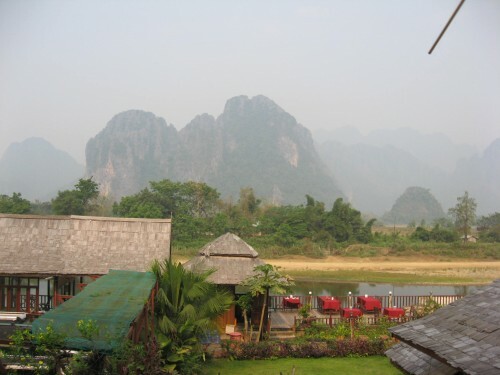 Throughout Vang Vieng one could see a lot of new development. Schools, houses, temples. 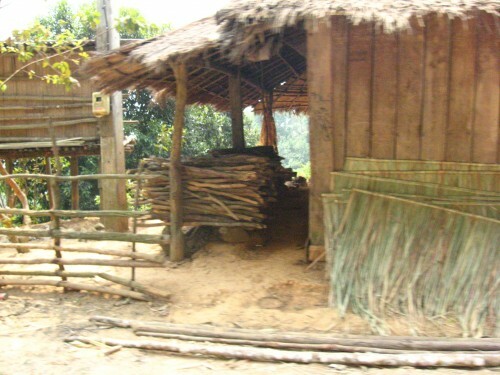 Here they are making bamboo roofs for the new homes in that village. 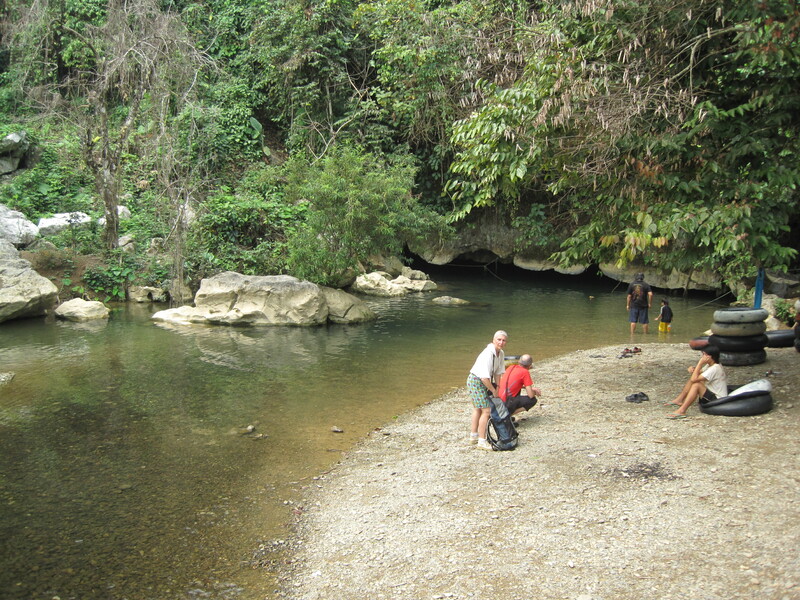 On our kayaking tour we also tubed through a cave. If you look past the tubs you can see the opening. There were large dome rooms and glow worms through out the cave. It was a cool experience but the water was very cold. Elephants are sacred beings in Buddhist/Hindu culture. 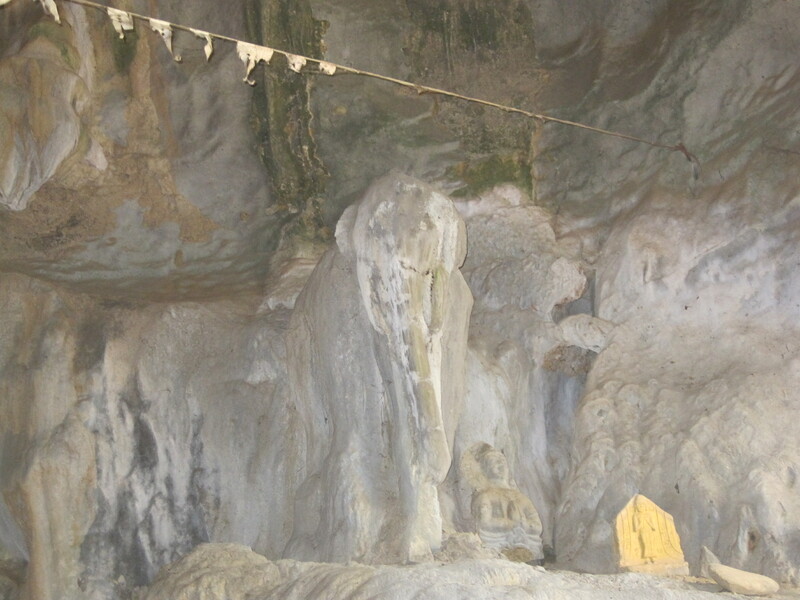 This cave is called elephant cave for obvious reasons. 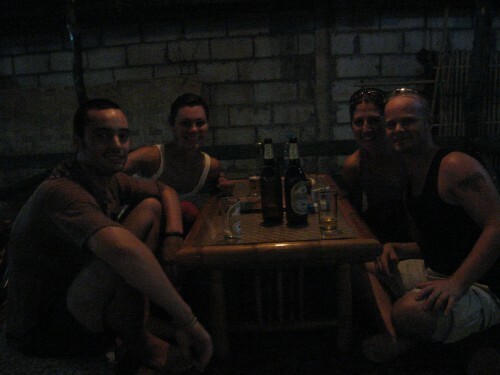 Good times in Vang Vieng. One of the main reasons Sebastien wanted to visit Chiang Mai in northern Thailand was to go to Tiger Temple. I believe that there are a few places, maybe two, in Thailand called the Tiger Temple. The one we went to was about a 40 minute cab ride from Chiang Mai. There is some controversy regarding the well being of these tigers. They were in small caged-in areas and seemed very aloof. My experience was that it was amazing to touch such a beautiful being but that they did looked very sad and depressed. I also had a moment with a younger tiger and his spirit asked me to free him. For those of you who don’t know, we have had a small change in plans. Sebastien’s rash and bumps came back after we left Vietnam. We had gone back to Thailand and initially things got better. However, after going from Chiang Mai (north) back to the islands (south) the rash and bumps returned. Now we decided it was best to change our flights around so that Sebastien could be seen by a doctor. Within two days of deciding to head home, we were on a plan back to the states. Sebastien stopped in LA long enough to buy an IPAD and then continued on to France. I stayed in LA to visit with Alison and Aaron. Sebastien was seen by a doctor the day he landed and was told the same thing that the doctor in Saigon said. Which is good news and a relief that it wasn’t something more serious. It is somewhat surreal to be back. I feel like our trip ended so abruptly that I didn’t really have time to say “good-bye”. However, we were both ready to be home. On May 10th I will be flying to France and then on the 12th heading to Greece to meet my friend Karina. I will return to France on the 18th and spend the rest of my time meeting Sebastien’s family. We will then return to the states on June 10th. Now that I have sometime and consistent internet I will fill you in on the rest of our adventures. Stay tuned. 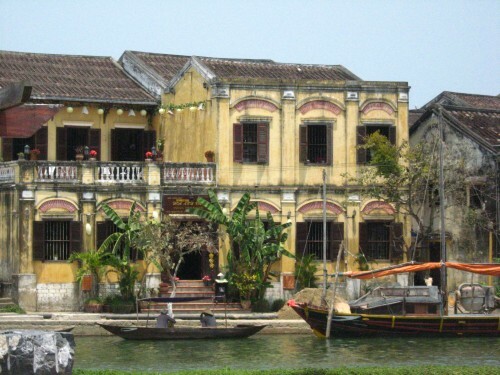 Le Loi is a street in Hoi An which is known as the tailor capitol of Southeast Asia. You can find the wealthy tourists and the broke backpackers rooming the streets getting suited and booted within the hundreds of shoe and tailor stores. 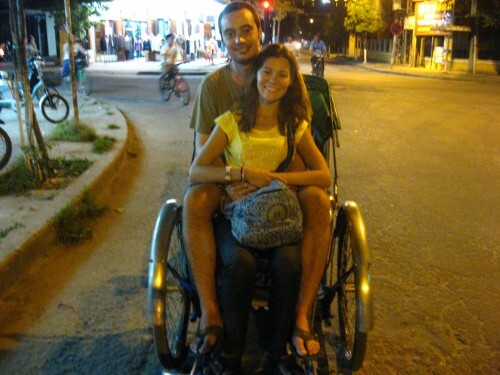 Sebastien and I spent a week in this wonderful Vietnamese city. Since getting engaged I had high hopes of having my wedding dress made in Hoi An. However, after several days of trying to find the perfect tailor and not knowing exactly what I wanted I lost my motivation. However, Sebastien and I had several suites, coats, dresses, and shirts made at many different stores. I also had some boots and sandals custom fitted. Sebastien’s suites came out beautifully. Most of my stuff came out just ok. In the evening, we enjoyed many of the different restaurants and meet some new friends. One of our favorite places was the Mango Rooms. Great recommendation Diana. Took a bike cab home one night. 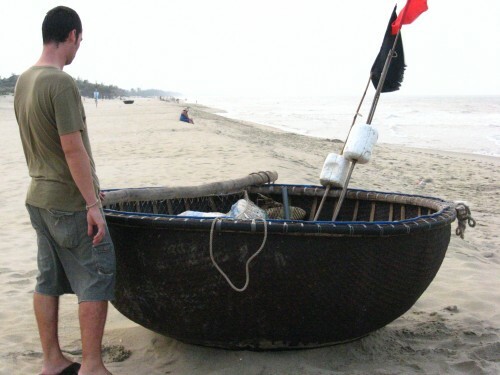 A fishing boat basket on the beach near Hoi An. 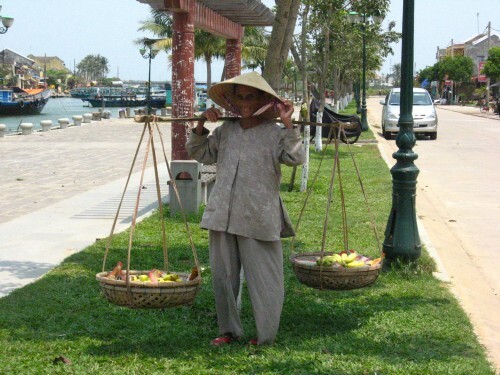 This lady is carrying fruit and wanted me to take her picture. She told me that I could take it for free but then followed me around wanting me to buy a banana. 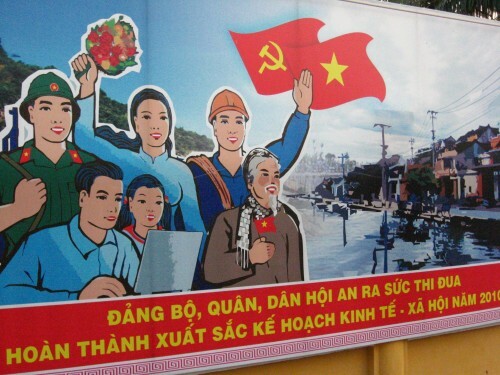 This was a common annoyance in Vietnam.